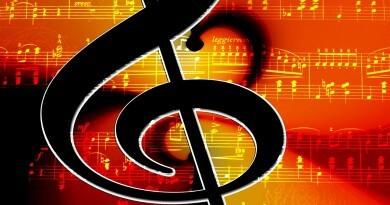 Texture is one of the basic elements of music. When you describe the texture of a piece of music, you are describing how much is going on in the music at any given moment. For example, the texture of the music might be thick or thin, or it may have many or few layers. It might be made up of rhythm only, or of a melody line with chordal accompaniment, or many interweaving melodies. Below you will find some of the formal terms musicians use to describe texture, and also some suggestions for introducing young students to the idea of musical texture and to these terms. There are many informal terms that can describe the texture of a piece of music (thick, thin, bass-heavy, rhythmically complex, and so on), but the formal terms that are used to describe texture all describe the relationships of melodies and harmonies. Here are definitions and examples of the four main types of texture. For specific pieces of music that are good examples of each type of texture, please see the Activity section below. Monophonic music has only one melodic line, with no harmony or counterpoint. There may be rhythmic accompaniment, but only one line that has specific pitches. Monophonic music can also be called monophony. It is sometimes called monody, although the term “monody” can also refer to a particular type of solo song (with instrumental accompaniment) that was very popular in the 1600’s. Homophonic music can also be called homophony. More informally, people who are describing homophonic music may mention chords, accompaniment, harmony or harmonies. 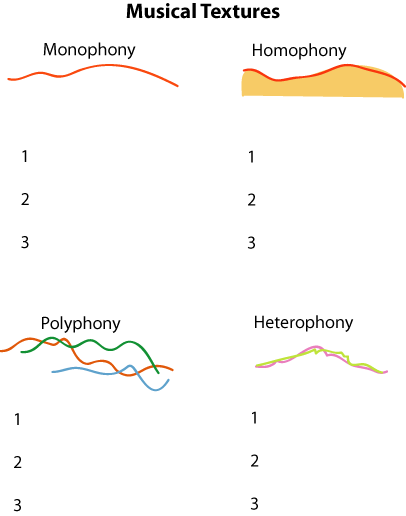 Homophony has one clearly melodic line; it’s the line that naturally draws your attention. All other parts provide accompaniment or fill in the chords. In most well-written homophony, the parts that are not melody may still have a lot of melodic interest. They may follow many of the rules of well-written counterpoint, and they can sound quite different from the melody and be interesting to listen to by themselves. 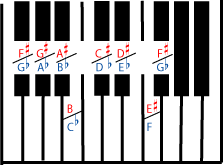 But when they are sung or played with the melody, it is clear that they are not independent melodic parts, either because they have the same rhythm as the melody (i.e. are not independent) or because their main purpose is to fill in the chords or harmony (i.e. they are not really melodies). Choral music in which the parts have mostly the same rhythms at the same time is homophonic. Most traditional Protestant hymns and most “barbershop quartet” music is in this category. A small jazz combo with a bass, a piano, and a drum set providing the “rhythm” background for a trumpet improvising a solo. Polyphonic music can also be called polyphony, counterpoint, or contrapuntal music. 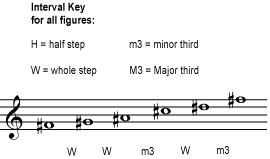 If more than one independent melody is occurring at the same time, the music is polyphonic. (See counterpoint.) Examples of Polyphony Rounds, canons, and fugues are all polyphonic. (Even if there is only one melody, if different people are singing or playing it at different times, the parts sound independent.) Much Baroque music is contrapuntal, particularly the works of J.S. Bach. Most music for large instrumental groups such as bands or orchestras is contrapuntal at least some of the time. Music that is mostly homophonic can become temporarily polyphonic if an independent countermelody is added. Think of a favorite pop or gospel tune that, near the end, has the soloist “ad libbing” while the back-up singers repeat the refrain. There are no examples of heterophonic music that would be familiar to most Western listeners. Some Middle Eastern, South Asian, and Native American music traditions include heterophony. Listen for traditional music (most modern-composed music, even from these cultures, has little or no heterophony) in which singers and/or instrumentalists perform the same melody at the same time, but give it different embellishments or ornaments. Here is an excerpt from James Romig’s Sonnet 2, played by John McMurtery. A Bach unaccompanied cello suite Gregorian chant Sing something for them without accompaniment Long sections of “The People that Walked in Darkness” aria in Handel’s “Messiah” are monophonic (the instruments are playing the same line as the voice). Apparently Handel associates monophony with “walking in darkness”! If anyone knows of any other good links or easy-to-find recordings of heterophony, or can share an audio file of a good example, please contact me. A good classical example is the middle section of Faure’s first nocturne, where the melody is played in both hands but in different rhythms (2:42-3:20 in the clip below).